In several historic American cities and towns, there’s often a story, or at least some mention of a “Spite House.” Unlike the Smith House, Jones House, or Gershenfelder House, the buildings aren’t named for the person that built it or family that lived there. It’s also not a style of historic architecture. The name indicates that the house was really built for spite, as after seeing one, it becomes clear that there’s no other reasonable function for the building. So, how does one erect a building that’s to have a primary function of infuriating the closest neighbor? Historically, it’s been accomplished by obstruction–by blocking a view, blocking access and even blocking sunlight. The most common feature shared by spite houses is they are usually very, very narrow. That’s because they’re most often jammed onto a lot that someone mistakenly assumed wasn’t wide enough to build any type of structure. Since authentic spite houses are usually narrow structures stuck close up against or between buildings, there can be some that are mistakenly identified. In other words, some skinny buildings might have sparked some imaginative stories of malicious design, but in reality, may be just a house appendage constructed for Mom-in-law, after she sold her home. The most notable spite house is one that I’ve never seen in-the-brick, as it was completed in 1882 and demolished in 1915. 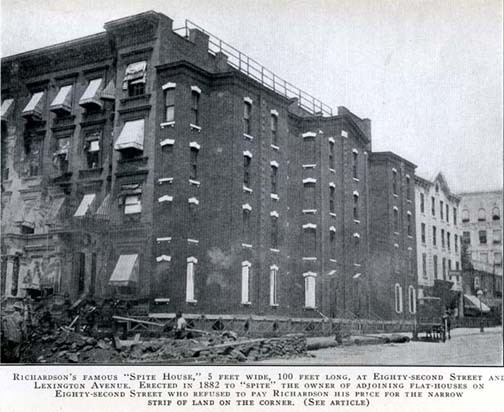 New York’s Richardson Spite House was four-stories tall and 104 feet long. Since it was only 5 FEET WIDE, it certainly meets the criteria of being built for spite. The story states that the owner of the adjacent plot only offered $1000 for the useless five foot strip of land and Joseph Richardson demanded $5000. The demand was refused and Richardson subsequently built the rather lean apartment house that included eight cramped suites. 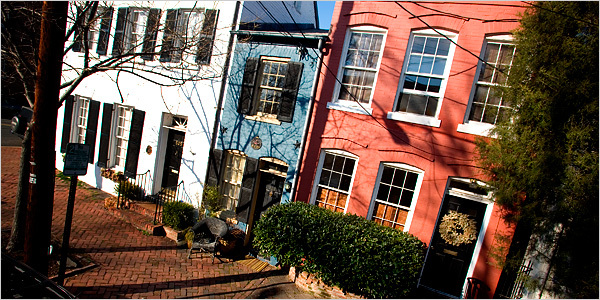 Another one, the 1830 Hollensbury Spite House, is located in Alexandria, VA. This narrow home was built in what used to be an alley between two larger homes. The legend states that the owner of an adjacent home also owned the alley. Tired of the noise of horse drawn wagons and carriages, John Hollensbury built the two-storey, 7 foot wide home to end the cut-through. Building codes, zoning restrictions and armies of lawyers have about done away with spiteful construction. One would have to be fairly creative to incorporate contempt into a building design these days.